Welcome to my blog which focuses on Canadian architecture, landscape, design, products, and real estate. If you're new to it - most of the articles are researched and written by students and recent graduates who are passionate about the many facets of shelter - but my own healthy obsession in all manners of housing and home, including posts on Toronto where I make my living as a realtor - do make an appearance on occasion. Like today, where I'm going to share my insights on housing, identity, and some examples of how marketers research and target condominiums to different cultures and lifestyles. This piece was originally featured on my company site - Urbaneer - which promotes character dwellings, loft conversions, architect designed homes and low maintenance living, in Toronto's original 42 'village' neighbourhoods. Have you ever walked down a Toronto avenue, admiring the wide variety of homes and pondering who might dwell within? "I wonder who lives there...". 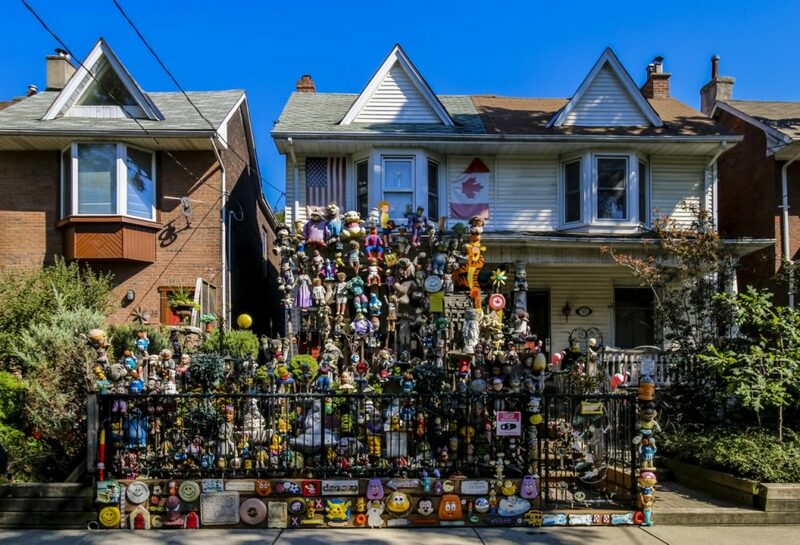 In the original City of Toronto, there is so much cultural, economic and social diversity stamped on our existing housing stock, most passersby can look at the exterior of most any dwelling and observe clues about who might occupy it. Did you know casual observations of the style of the house, its condition, and landscaping can reveal several clues about its residents? Even the objects around the property, like a flag, hung over the front porch, bikes tethered to the stairs, or a collection of garden ornaments (or stuffed animals!) give even more insight about the residents’ personalities in how they present the place they call Home. Even houses lining a street that seem identical in style still communicate lots of information to passersby. So, if our homes reflect who we are, 'What does your home say about You?'. The process of choosing a property and its location is complex. First, we define our practical needs such as the number of rooms required for sleeping, living and working. Second, we determine what location and style best reflect our social values and affiliation to the community. Third, we define our budget and evaluate how realistic we can tend to our needs and wants within our financial. means During this evaluation, we discover that our housing choice reflects our age, status, identity and family size. From urban edge to bucolic suburbs, some neighbourhoods are geared to celebrate urban cultural amenities, others to raising children. Whatever your particular case, research on housing and identity indicate that owning a home, as part of the Canadian Dream, is seen as a sign of financial and personal success, as well as reflecting one as “biographically on schedule”. In fact, not too long ago I wrote a post on how the Canadian government socially-conscripts Canadians from a young age to desire homeownership, along with its 'buy-in' to immigrants as fulfilling this 'Canadian dream'. As someone who bought his first home at the age of 23, I can attest my desire to own bricks and mortar burned brightly in my youth, though in retrospect it occurred without anyone - from my realtor to my lender to my real estate lawyer - never fully informing on what the real costs of buying are, nor with communicating the risks associated with owning. It was all presented as being easy-peasey, which was short-lived when I was told I needed an additional $800 in funds on my property purchase closing date, and the roof leaked substantially the first night I spent in my new home. In fact, it seems a lot of property owners have their own tales of domestic dream-come-true turned nightmare-in-reality. In fact, the objective of the Urbaneer blog - now in its 10th year - is because I believe every buyer and seller should be fully informed on every facet of shelter. If you're considering purchasing real estate in Toronto (and Canada), here's Why Does Homeownership Remain A Priority For Canadians, Despite The High Costs? and, for good measure What Is And Isn’t Covered In A Home Inspection?. So What Kind Of Home Would You Buy? How we describe our shelter, and what we dream of living in, can have many nuances to each of us. But it's also instantly pre-determined in the many choices rooted in the English language. So, if I were to ask you what kind of dwelling you would like to buy, I would instantly have a visual construct if you said you'd like to live in a luxury penthouse, a stately mansion, or a cottage with a white picket fence. You might also request a preference for a rancher, a saltbox, a chalet, or a cabin. Or maybe an English Tudor, a French chateau, or an American Colonial? Unfortunately, Toronto doesn't have a substantially wide assortment of housing options (and a lot of stylistic pastiche - have you ever checked out the hysterically scathing but well-intentioned well-informed American site called McMansion Hell? ), such that most buyers will discuss they're seeking a detached, a semi-detached or row-house, or a co-op, co-ownership or a condominium (which includes stacked townhouses). Though, as the fellow who pioneered the Innovative Space Market in the 1990s to serve those seeking a unique urban home, I've had plenty of experience selling one of a kind architecture, including custom sustainable architecture, coach houses, converted grocery stores, and authentic lofts in century warehouses converted into condos. Whatever your preference, each type of dwelling conveys its own kind of domestic bliss. And most of us see ourselves living in one…or several! How do you decide? How will you search for your perfect home? Here's my post called How To Search For Your Next Property Purchase. In the past I've written about The Psychology Of Real Estate, Housing & Home‎, which has long been part of my fascination - borne out of my research in Housing As A Symbol Of Self in Graduate School. 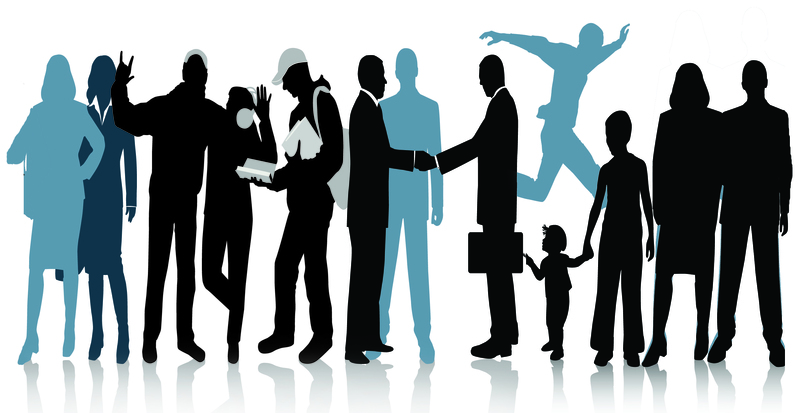 The influence of ethnicity as it's shaped Toronto - called The City Of Neighbourhoods - is renown. From the mid-1800s to mid-1900s, each arriving ethnic group helped expand the city’s rich industrial economy which was centred around Toronto’s natural harbour. As a result, factories and work yards agglomerated next to the waterfront while working-class immigrants tended to congregate within walking distance, primarily in the old centre of town adjacent to the waterfront. Cultural enclaves such as the Ward, Kensington Market, and Cabbagetown, became reception areas for waves of immigrants from different parts of the globe—Jews, Eastern Europeans, Italians, Portuguese, Vietnamese, Irish and the list goes on. The Ward, bordered by present-day Queen Street, Yonge Street, College Street, and University Avenue, became a nucleus for East European Jews at the end of the turn of the century. By the end of World War II, an outdoor market had begun to develop just west of the Ward strongly influenced by Ward residents, becoming the focal point for the majority of the city’s Jewish population. To the west of Kensington evolved another enclave, Little Italy, created by a large wave of Italians following World War II. In Toronto’s east end, Irish immigrants fleeing the potato famine settled along the west bank of the Don Valley, then known as Don Vale. The new settlers, for the most part working class unskilled labourers, were known for planting hardy cabbages in the front lawns of their modest homes, hence the inspiration for the neighbourhood’s appropriate title, Cabbagetown. In the 1870s-80s, new waves of British immigrants arrived in Cabbagetown, some more affluent than their predecessors, who built stately residences next to the existing worker’s cottages creating an unsegregated area uncommon for Toronto at that time. At the same time, the Town’s industrial and political elite flocked towards more quiet and spacious locations to the north and west, capitalizing on the many pristine ravines which offered a perfect setting for upper-class suburban life. As a result, an alternative set of neighbourhoods developed, with streets that followed the lay of the land shaded by rich green canopies overhead, cut off from the hustle and bustle of downtown life. Places like Rosedale and Moore Park to the north, or High Park and Swansea Village in the west. One of these suburbs at the edge of the Town of York, the Village of Yorkville, began as a middle and working-class residential neighbourhood which, a century later, had become the centre of Toronto’s Bohemian beatnik culture, before evolving into the chicest part of town! Check out my post called Gentrification, Densification, And The History Of Toronto Real Estate. Our culture, status, and identity have long been reflected both in our connection to place, and shelter here in Toronto, which is brimming with examples. We can see it in the Waspy formalism of stately Rosedale, the elegant opulence of old Forest Hill, or the arched facades of houses in Little Italy that were rebuilt by arriving immigrants. Whereas Rosedale is protecting the old guard tone through heritage restrictions, Forest Hill - once the bastion of the Jewish community - is being decimated by McMansions as it gentrifies with a new level of international multi-cultural wealth. I wrote about it in my site dedicated to all aspects of Canadian shelter - Houseporn.ca - in this post called A $15 Million Mansion In Toronto’s Tony Forest Hill. A few years ago I wrote about The Face Of Toronto Condo Living - where I explored the evolution of the condo in Toronto (which is due for an update given the emerging trend for some pretty cool complexes including the pixilated cubes in BIG's King Toronto, and the honeycomb facade of Studio Gang's 1 Delisle near Yonge St Clair). But what a lot of people don't know is that Toronto also has a history of constructing condos catering to specific cultural groups? In fact, one doesn't have to look any farther than three buildings on Toronto's Mink Mile - located on Bloor Street West between Bay Street and Avenue Road. 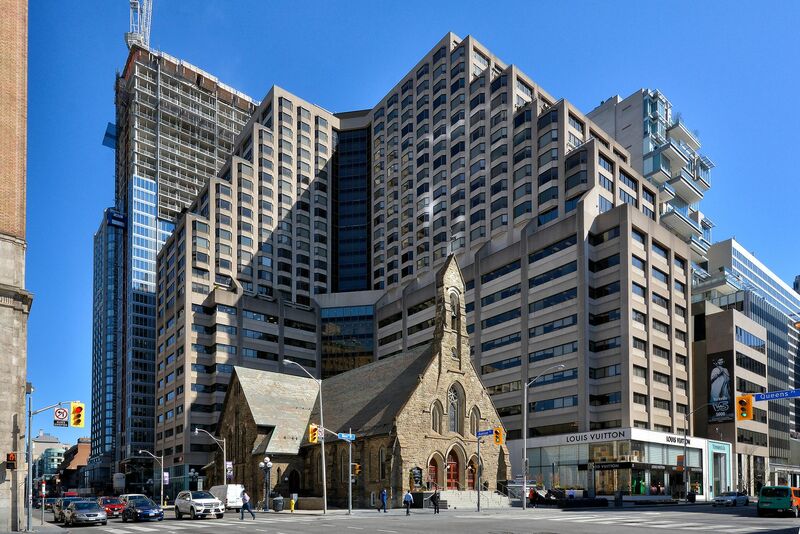 The first building is Renaissance Plaza located at 175 Cumberland - basically behind the Church of the Redeemer - on the northeast corner of Avenue Road and Bloor. This elegant tower - with its lobby of paneled wood - was completed in 1983. Sold to wealthy wasps, this building for anglophones is designed to be understated, discreet and a bit hush. Developed by Bramalea Ltd., the tower is home to 127 units (1032 square feet to 4106 square feet) located on the top 15 storeys that cap 10 floors of commercial space. Residents share in top-notch building amenities like a racquetball/squash court, pool, whirlpool, sundeck, sauna, gym, party room, 24-hour concierge, security, and valet parking! For those lucky enough to own on the top two floors, the suites also have wood-burning fireplaces (which would be unheard of today)! However, it's only the residents of select south-facing suites who can boast impressive private terraces. The second is 'The Residences At 110 Bloor West'‎ which rises 21 storeys, and houses 156 one and two bedroom units that range from 1100 square feet to 3473 square feet. The generous layouts are reminiscent of a time when luxury and space ranked above the convenience of a central location (which doesn't get any better than this intersection). Built-in 1980 by developer Cooper Consultants, this condo was constructed for the mature Jewish community downsizing from their larger houses. Whereas I once read that WASPS (white Anglo-Saxon protestants) are taught not to flaunt their wealth, because their faith believes the earth is limited in its resources so it's in bad taste to show off your wealth as it means you have more at the expense of the less fortunate, the Jewish community recognize that wealth can be created, not at the expense of another, but through intelligent investment. As a result, they celebrate their accomplishments with more polish and pizzazz. Perhaps this is why the lobby is marble and mirror, while the suites were designed embracing a more contemporary open concept style including featuring floor to ceiling windows which embrace the city views. The Residences At 110 Bloor boasts amenities like a party lounge, gym, swimming pool, hot tub, sauna, rooftop garden, community barbecues, exclusive racquetball court - and like 175 Cumberland - valet parking. And then there's 102 Bloor Street West - originally an office building (built 1966) was converted to a residential condominium in 1997 by L & A Development (Canada) Ltd. This was one of the earlier condos which, as one of its presale marketing campaigns, targeted the Asian community exiting from Hong Kong as it officially reverted to Chinese sovereignty after 156 years of British rule. This building houses 120 units spread over 14 storeys, ranging in size from 530 square feet to 2430 square feet. The building has an array of on-site amenities includes a rooftop deck/terrace, gym, sauna, game room, meeting room, concierge, 24-security, and underground parking. Of course, the same property can be appealing to different buyers who fall into different target markets beyond their income, socio-economic status or cultural affiliation. I found this to be very much the case in my Graduate Research on Loft Condo Conversion Owners. In the early 1990s, as part of my graduate research in Housing & Identity, I studied the residents of the first 20 loft condominium conversions in Toronto to examine how their physical homes were a reflection of their personalities, and how they valued the space of their home as a means of self-expression in differing ways. Surveying the residents of Toronto's first 250 lofts to determine who they were, what they did, and their psychographic profiles, I discovered that around one third of the respondents living in these buildings (situated in what were considered to be marginal locations at the time) could be classified as Artists engaged in photography, sculpture, and painting; another third were creative professionals operating in the fields of media, design, and fashion, and the final third were white-collar professionals occupied in health care, finance, and technology. To my surprise, the points of view by which each of these groups reconciled their living environments were surprisingly different. I discovered the Artists living in their lofts were less invested in the appearance of their homes, and much more concerned with the spatial capacity to create their art. Their spaces were less adorned, fitted in basic finishes, and in habitable condition (think: concrete floors, a simple laminate kitchen, and a white 3-piece bath). Whereas their art was the vehicle for self-expression, space was about utility and function. It was the mirror opposite for the second third of my research, who were the creative professionals. This segment of owners was highly absorbed and engaged in their ability to design and modify the space to reflect who they were creatively. This group invested a significant portion of their time, income, and skills in customizing their lofts to reflect their identity. Their one-of-a-kind lofts (think: chef's kitchens featuring a Garland gas range, floating mezzanine bedrooms, and glass block washrooms) were physical incubators of progressive, liberated self-expression; their homes were their personal masterpieces. The white-collar professionals, who appreciated high design, shared a commitment to self-expression similar to the creative professionals. However, lacking the skills to create it, they preferred to purchase their lofts ready-made and demonstrate their identity through its contents. They either hired designers to create their mise-en-scene or they shopped for the latest objets and contemporary art (think: high-end electronic media equipment, pool tables, humidors, and framed cell animation) to serve as status-markers and to showcase their cultivated commitment to trends and styles. 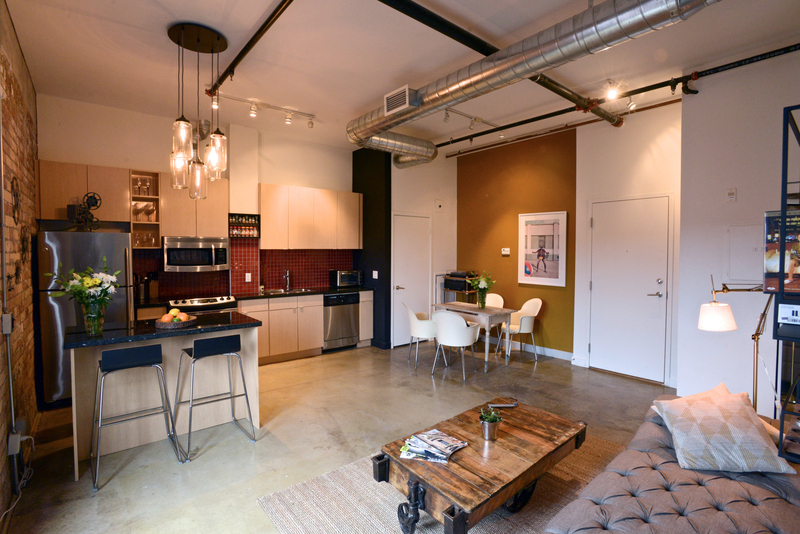 This group chose loft living to symbolize both their subscription to modern living and their rejection of traditional housing forms. The more affluent the occupant, the more likely their loft was of a quality and calibre worthy of a magazine feature. 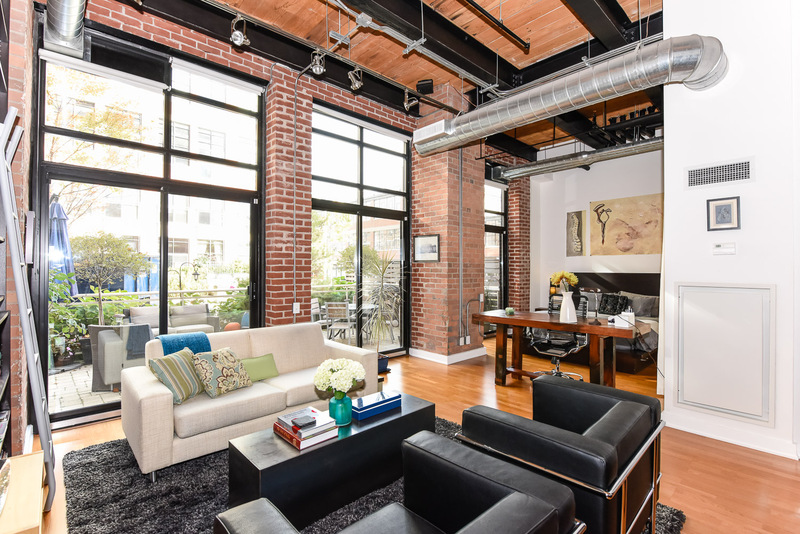 These market segments - the framework for the original 'loft lifestyle' - underscores how individual a property search can be today, and how the same space can afford not only different purposes but different meanings. Here's my blog that explores this --> What Is The Difference Between A Hard Loft And A Soft Loft? ‎When it comes to real estate sales and marketing, be assured every new condo development you see has a team who have carefully analyzed its target buying market. It's a very sophisticated industry - just like every other product we purchase today. It's not much different in the resale real estate market too - if you're engaging the services of a realtor who has focused learning about market segmentation. Just recently I sold A Panoramic Perch Overlooking Rosedale At Reputable Bloor Walk Condominium. I pegged this house-sized condo with an exceptional view would be purchased by one of two target markets. This first was a growing niche market - which is the professional late 30s/early 40s couple who may have a child or two, who are opting to live in a large condominium in a good school district because of their busy lifestyles (here's Dear Urbaneer: Should We Raise Our Kid In A Condo?). The second was a more established market - the boomer zoomer couple who, in this case, would be downsizing from a house located nearby just north of Bloor Street - like in the neighbourhoods of Rosedale, Summerhill or Deer Park. They'd be looking for a generous space plan of at least 2 bedrooms and a den, ideally with a separate kitchen, and a pretty view. (here's Downsizing: The Challenges Of Finding A House Sized Condominium which shares insights on the boomer market). In fact, the first buyers through the property happened to fit this profile to a T. The Buyers lived nearby in the Republic of Rathnelly who, once they purchased the unit, cashed out by selling their 3bed detached house for over $2Mil in 3 days. So Who Will Buy This Spectacular Glass-Wrapped Penthouse Near Yonge & Bloor In The Video Above? Right now I have a spectacular penthouse at Casa Condominio near Yonge & Bloor listed for sale for $2,388,800 which, by virtue of its price point, automatically narrows the number of Buyers who might consider it. Located near Toronto’s ‘Mink Mile’ On Bloor which is great for shopping, some stellar dining establishments (I love La Societe and Wish Cafe & Bar), daily amenities like Yorkville’s Whole Foods Market and being near a number of cultural and educational institutions including the Univesity of Toronto, The Royal Ontario Museum and the superb Toronto Reference Library the target market for this exceptional residence is definitely more downtown than uptown. It's also well-suited to those who love light, who favour crisp clean lines and who covet a spectacular panoramic city-lake-vista thru expansive floor to ceiling windows in a building executed with a strong linear scale and rhythm rooted in the International Style of the Modernist Architecture Movement. The Buyer for this residence is unlikely to locate north of Bloor because living in the heartbeat of the city is important to them. If they were to locate north of Bloor, they'd either choose a place in Yorkville or perhaps Yonge & Eglinton providing it was sky-high polished glam. This is a sophisticated affluent niche market with a high standard and exacting attention to detail. Think high-earning savvy fashion-forward 30 to 40-something swingles or couples (possibly with a Trust Fund) in the occupations of health care, technology, corporate finance/law/venture development, media and/or entertainment (pretty much any of the movers and shakers on Dragon's Den); OR a cool creative professional divorced Dad with (almost) adult kids; OR an international buyer with deep pockets whose children need accommodation while attending U of T or a genuine rising star in his or her career-path with some high-style swag relocating from another city. Is that you? Well-positioned amongst coveted amenities, in a setting of uncompromising elegance, this perfect penthouse at 33 Charles Street East is special. If you're cosmopolitan, a non-conformist, and on trend (if not trend-setting!) this rare offering - well suited to the urbanite with cultivated tastes and a mise en scene lifestyle - is certainly worthy of consideration! Want to know more? Check it out --> Culture, Couture & Contemporary Living At Casa Condominio Near Yonge & Bloor, Offered For $2,388,800. Are you interested in the mnemonics of housing and what motivates us to make a property purchase?